We want to satisfy every customer and we believe in the fantastic quality of our products, and their ability to cause serious long-term dietary success. 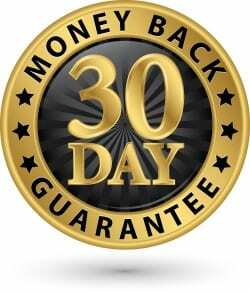 However, we understand that sometimes this isn’t possible, but we’re so confident in the benefits of our products that we offer a complete 30-day money back guarantee. We have seen fantastic results across 12 countries, with scientifically-proven beneficial products and ingredients as part of a complete plan to improve health and reduce body fat, whilst building muscle and improving athletic performance. However, if you are unhappy with the results you aren’t obliged to continue using the products – if you’re unsatisfied or have substantiated complaints, we’re more than happy to provide a full refund. You can apply for a refund within 30 days of your first purchase to get 100% of your money back. We’re so confident that you’ll love our products that any problems during your first 30-days using our products that you can apply for a full refund on all of your purchases. This only applies to your first order, however, and shipping and handling fees are non-refundable. When can you request a refund? A refund is appropriate when you’re unhappy with the products or results – this can be in any field of your life from athletic performance to weight loss. If you’re not satisfied with our product, we’re not satisfied taking your money! Isagenix will also refund your money if you have a specific health condition and your personal physician doesn’t believe that our products are good for you. Despite all these possible situations, and our willingness to cooperate on refunds and returns, they are still incredibly rare – we have these policies because we believe wholeheartedly in the accessibility and health-benefits of our product. The fact is that the vast majority of customers love our products and don’t want to return them! Our customers are long-term subscribers and associates because they’ve seen the results and want more. We also provide a quality guarantee because we believe that the products we sell should be accountable to the highest manufacturing and handling standards. We invest a lot of time in our products, constantly revising and improving them so that you receive the best possible results. We’ve made it easy to get your money back if you’re not satisfied with our products because this is so rare – our products are designed, reviewed and manufactured with the highest quality. Any shortcoming in quality or freshness is unacceptable as we have high standards for ourselves and will be met with an immediate, full refund with evidence. Send us an email detailing your problem and why you’re unsatisfied with the product so we can work on it in future. You can or email our team at CustomerServiceANZ@Isagenixcorp.com. – include your Isagenix Member ID and invoice number from your order so we can identify your order. Alternatively, you can call Isagenix’ customer service team directly on 0800 451 291. Return the remaining products to your local Isagenix distribution centre as instructed. Your money will be refunded within a few days, with a full refund on the products you purchased. For more information about Return and Refund Policy for Australia and New Zealand Residents see here for Return and Refund Policy.